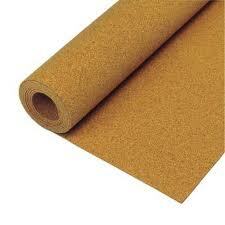 Cork Underlay comes in 6mm (1/4") rolls and 12mm (1/2") sheets, and is good for use over a concrete slab floor. It is mold and moisture resistant and it is hypo- allergenic. The cork underlayment is made in Portugal the source of the world's best cork and is manufactured sustainably.